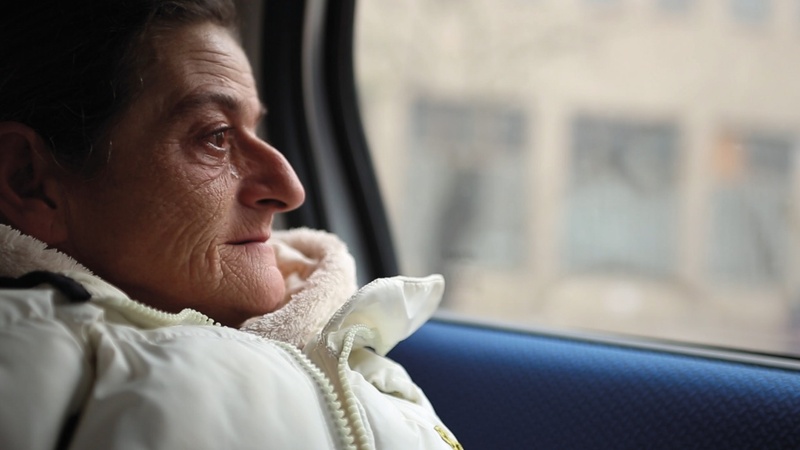 Making its U.S. premiere at Sundance in the World Cinema Documentary Competition, A Woman Captured is the remarkable debut feature doc from Hungarian filmmaker Bernadett Tuza-Ritter, who stumbled upon a horrifying story in her native country hidden in plain sight. Marish is a housekeeper in her early 50s, though her hard-knock life has aged her considerably. She has spent over a decade cooking, cleaning and serving, mostly as a human punching bag, both verbally and physically, to a mystery woman of indeterminate wealth who remains off-screen. That woman, Eta, who we hear but never see, has allowed Tuza-Ritter access to her “servant” for a monthly fee. Marish, we come to learn, is a modern-day slave, toiling long hours without pay, including working a factory job on top of housekeeping duties, the salary of which she turns over to Eta as well. As Tuza-Ritter slowly gains Marish’s trust, the line between filmmaker and subject dissolves — and what began as an investigation into a deeply troubling circumstance becomes nothing less than a nonfiction escape thriller. Filmmaker was fortunate enough to speak with Tuza-Ritter about blurring that line, influencing onscreen events, and how those decisions have affected her protagonist’s fate. Filmmaker: Could you explain how exactly you discovered Marish and her remarkable story? How did you meet Eta in the first place? Did you suspect from the start that you’d be uncovering some ugly truths about her relationship with her “servants”? Tuza-Ritter: I met this family a few years before the shooting through a friend of mine. I saw that they had servants, and that there was a master-servant relationship, but I was not aware of the real situation. A few years later I had to make a short documentary about “a day of a person” for my school. I couldn’t forget Marish’s face so I called the family to ask if I could shoot a few days with Marish. I arrived with the visual idea that I was not gonna show the others’ faces, only Marish’s, so that would keep them anonymous, so Eta gave me permission. During those days Marish told me that she was not paid, and that she was sent to work in a factory but had to give all her money to Eta. So I decided to stay longer to figure out what was happening there. After awhile Eta asked me to pay her money if I wanted to shoot further in her house. Filmmaker: The documentary certainly plays out like a thriller, as we’re never quite sure what will become of Marish. Did you ever fear for your own safety, though? Though we never learn the source of Eta’s money, I’m guessing she has ties to some truly dangerous characters. Did you take any specific precautions? Tuza-Ritter: I did fear a lot, as I was shooting alone and could never know what would happen in the next moment. Some members of the family were in prison and others were really aggressive. I knew that the police couldn’t do anything against modern-day slavery, as nobody was physically locked in the house. So the whole situation was really complicated, and I was always prepared that they might stop me from shooting at any time. But the fact that I was paying money to Eta for the shooting kept me safe. I had become kind of an income for her. So the chance was small that she would hurt me. Filmmaker: You certainly crossed the line from being behind the camera to becoming an active participant in influencing the events that unfold onscreen. Right from the start we even learn that you’re paying Eta to film Marish, and under Eta’s strict rules. What was that like? Were you ever uncomfortable with the decisions you had to make in order to make this film? Tuza-Ritter: I felt uncomfortable during the whole shooting because of the circumstances, but I believe I made the right decisions. After Marish told me her situation I felt a huge responsibility, and it was clear that I could not leave her alone anymore. It was important to follow Eta’s rules because it was the key to being close to Marish. Marish felt more safe when I was there, so we both agreed on playing according to Eta’s rules, and not to tell her about Marish’s plan about the escape. As a filmmaker I also felt responsible to let people know that modern-day slavery existed, and a film can reach thousands or millions of people. I was honored that a person in distress trusted me to present her fight for dignity. I never told Marish what to do. I was always thinking it had to be her own decision to escape, in order to make sure she really meant it, and [so that] she wouldn’t end up in such a situation again. I was patient, and I was paying attention to her. This had made her feel she was not alone anymore. So during the shooting she slowly became strong enough to change her life. I only offered her two things — she could use my phone if she wanted, and I helped her search on the internet when she needed something. Filmmaker: We never really learn how Marish initially ended up in the situation that she’s in with Eta. Why did you decide not to disclose this? Was that an editorial choice, or was Marish herself not forthcoming with that information? Tuza-Ritter: It was an editorial choice. Too much talking could have made the storytelling less powerful, and I wanted to build up her emotional development towards the escape, to understand her feelings. This process was more important to me than including all the information. On the other hand, my visual concept was to mix fictional elements with documentary, but too much talking would have broken the cinematic experience. At the same time I wanted to bring up questions, to make the audience talk about this. In the past Marish had a family with six children. As she had to work for her children, she was looking for a job and a family offered her housework. First they asked her to come once a week, then two times a week, then three times, etc. And slowly she lost her freedom. She realized she’s not even allowed to go back home anymore. She was not paid anymore, but she was forced to work and not even her husband could help her to escape. They told her if she told this to anyone they’d hurt her children. So this is how she ended up in slavery. Filmmaker: What’s been your characters’s reaction to the completed film? I assume Marish and Eta responded in totally opposite ways. Tuza-Ritter: When Marish saw the film she was crying, but she said it was a beautiful film and it told the truth. She was there at the premiere in Amsterdam. It was a beautiful moment when she came up to the stage. There was a standing ovation. Filmmaker: The doc is shocking on several levels, but notably that there doesn’t seem to be any government agency or nonprofit in Hungary for Marish to turn to. Do you see your film as an activist doc? Are you hoping to shine a spotlight on this global problem and enact systemic change through any outreach attached to the film? Tuza-Ritter: With my producers Julianna Ugrin and Viki Réka Kiss our goal is to reach as many people as possible, to let people know that modern-day slavery exists. We want to give hope to the victims, and to try to make a change. Modern-day slavery is happening in our neighborhood, in Hungary, in Europe, everywhere. And the numbers are huge — more than 45 million all over the world. Victims have no idea if there is help, and how to reach it. Even for me it was hard to find any help. I think the organizations in Hungary don’t really know what the victims need if they’re captive, and what their possibilities are to reach any organization, so we need to think with these people’s minds. I really hope the film will be an eye-opener to this serious social problem, and I wish we could achieve a systemic change.